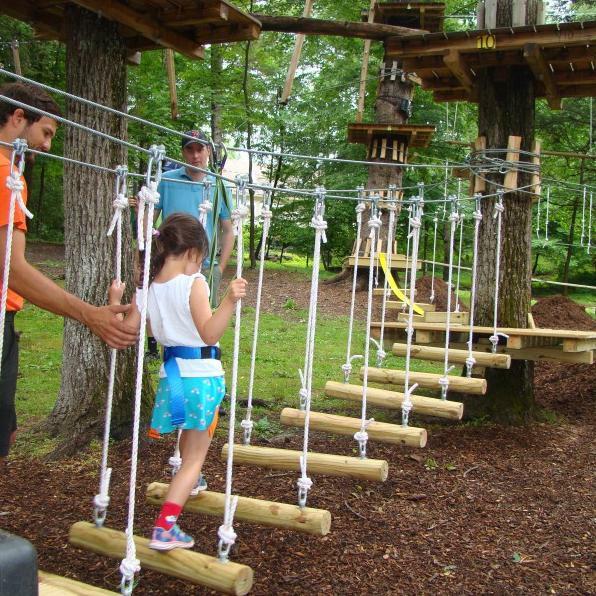 BUSHKILL, PA (SUMMER 2016) – Pocono TreeVentures aerial adventure ropes course in the Pocono Mountains is adding even more fun with two new children’s adventure courses for ages 4 – 7 and night climbing and zipping on Saturdays beginning June 18. Gina Bertucci, spokesperson for TreeVentures, said, “We have been growing each year since our opening with the addition last year of TruClimb tree based climbing walls. This year, we’re adding two new children’s courses and night climbing. We started climbing in the dark at our Hallowscream event last fall. It was so well received, we decided to add it this year throughout the summer on Saturday nights.” The new children’s area of the park will be called KidVentures with courses that use the same harnesses and hardware as the adult courses but are built closer to the ground with elements created just for children. PoconoTreeVentures.com where you can get additional aerial ropes course information and reserve your day session tickets or overnight stay. Pocono TreeVentures is open daily from 10:00 am to dusk throughout the summer.